PriyaGoDance: Featured Lady of India- Ladies of hip hop website. 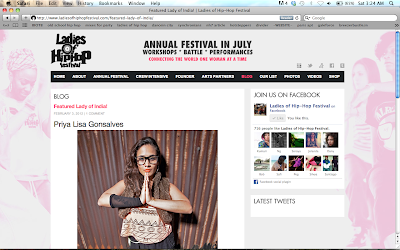 Featured Lady of India- Ladies of hip hop website. I was really excited amongst most of the different work I've been doing these last few months about being featured as India's Lady Of Hip Hop on international website based in the states. Feels great to be recognised for years of sticking to what I loved and now feeling like it was worth the many obstacles. Am so happy for Michele at Ladies of hip hop supporting me and Urbanista! Ladies of hip hop link.